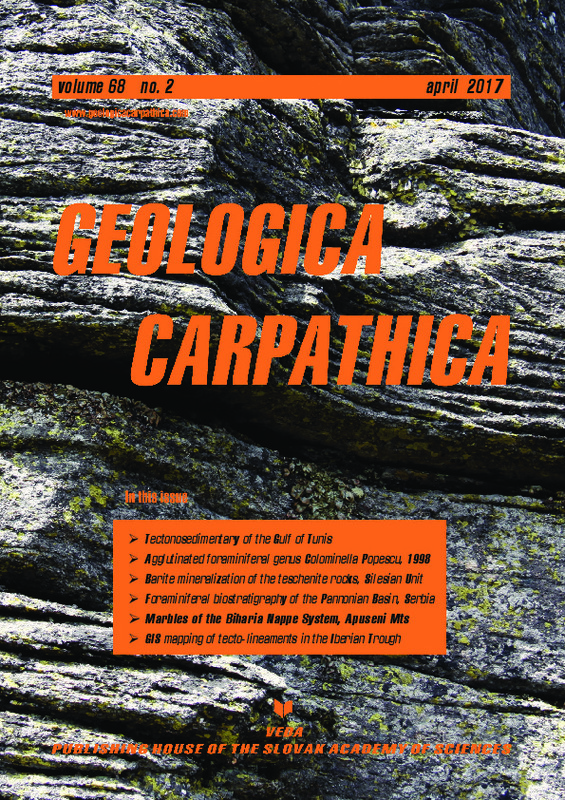 Abstract: Micropalaeontological and biostratigraphical studies included Campanian–Maastrichtian complexes from five oil exploration wells drilled in northern Serbia (Vojvodina): the first is a carbonate-clastic complex and second is a complex containing ophiolites intercalated with hemipelagic and pelagic sediments. Within the studied complexes, rich associations of planktonic and benthic foraminifera, calcareous nannoplankton, palynomorphs, as well as shallow and deep-water fossil detritus were determined. The presence of relatively rich associations of planktonic foraminifera allowed recognition of two biozones: the Globotruncana ventricosa Zone, observed in the sediments of the carbonate­clastic complex and the Gansserina gansseri Zone, observed in both complexes. Except biozones, based on documented index species, for some units in both complexes, larger benthic foraminifera species had special biostratigraphical value, and in some of them, the calcareous nannoplankton zones were recognized. The studied complexes represent deep-water formations, generated in oceanic island arc and trough zones. The presence of limestones, which originate from destroyed rudist reefs, is explained by transfer by means of gravitational transport mechanisms of shallow-water sediments to deep-water depositional environments. In this paper, the results of more detailed biostratigraphical and palaeo-ecological studies of foraminifera associations in Campanian–Maastrichtian complexes in Vojvodina are presented. Combined with lithological studies, seven units were determined within the complexes. The obtained results are important as a part of multidisciplinary, regional exploration of both complexes, generated in specific geological conditions, that today constitute a part of the pre-Neogene basement complex in the southeastern part of the Pannonian Basin. The Campanian–Maastrichtian carbonate-clastic complex represents sedimentary cover of the Eastern Vardar Ophiolitic Unit, while the ophiolites intercalated with hemipelagic and pelagic limestones belongs to the Sava Zone.